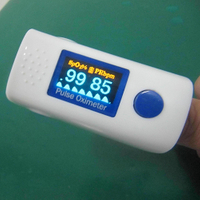 -Do not attempt to service the pulse oximeter. Only qualified service personnel should attempt and needed internal servicing. 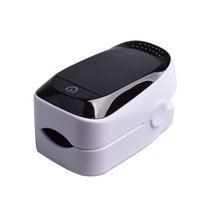 -Prolonged use or the patient's condition may require changing the sensor site periodically. Change sensor site and correct alignment at least every 2 hours. -Sp02 measurements may be adversely affected in the presence of high ambient light. Shield the sensor area (with a surgical towel, or direct sunlight, for example ) if necessary. √ Placement of a sensor on an extremity with a blood pressure cuff arterial catheter, or intravascular line. √ The patient has hypotension severe vasocontriction severe anemia or hypothermia. √ The patient is in cardiac arrest or is in shoe. √ Fingernail polish or false fingernails may cause inaccurate Sp02 readings. WARNING: EXPLOSION HAZARD --Do not use the oximeter in a flammable atmosphere where concentrations of flammable anesthetics orother materials may occur. WARNING: Do not throw batteries in fire as this may causes them to explode. WARNING: Do not attempt to recharge normal dry-cell batteries, they may leak. And may cause a fire or even explode. 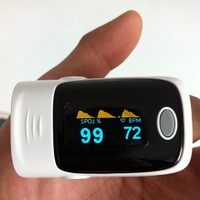 WARNING: Do not use the pulse oximeter in an MRI or CT environment. CAUTION: Keep the operating environment free of dust, vibrations, corrosive, or flammable materials, and extremes of temperature and humidity. CAUTION: The battery must be taken out from the battery compartment if the device will not be used for a long time. CAUTION: Do not operate the unit if it is damp or wet because of condensation or spills. Avoid using the equipment immediately after moving it from a cold environment to a warm, humid location. CAUTION: Never use sharp or pointed objects to operate the front-panel key. CAUTION: The device shall only be used if the battery cover is closed. CAUTION: The battery must be proper disposed according to local's regulation after their use.